The Biewer Breed Club of America, Inc. has worked diligently on educating others about this splendid breed. It will be the National Breed Clubs responsibility to preserve, protect and promote the breed. We have not taken on this responsibility lightly, and are very proud of our beginnings, while continuing to educate and promote the Biewer as a breed of its own merit. The Biewer Breed Club of America, Inc. is the only Breed Club who has exclusively bred Biewer to Biewer since the Club's inception. We do not condone the mixing of any breed into the Biewer. RVD/UCI Standard the breed is shown under in Germany and other parts of the world. That of a long-haired toy terrier whose hair hangs evenly and straight down each side of the body and from the base of the skull to the end of the tail. The animal should be very compact and neat. The tail should be carried up. The outline should give the impression of a powerful and well proportioned body. The head should be rather small and flat, not too proportionate round in the skull, nor the muzzle too long with an absolute black nose. The hair on the head is long with colors: white-blue-gold, symmetrically colored. Medium size, dark and sparkling with a sharp intelligent expression and placed in a way that they could look straight. The shall not be too prominent and the eye rims should be of a dark colour. Small V shaped ears, that are carried erect, and not too far apart, covered with short hair. The teeth should all be the same. Either a scissors bite or level bite is acceptable. Premolar faults are tolerated. The legs should be totally straight, well covered with hair. Legs rather straight, well muscled, and well covered with hair. Very compact well formed hips, and a level back line. A complete tail, with lots of hair, carried slightly higher than the level of the back. As rounded as possible, with toenails being white or black. The hair on the body has a length 3/4 down the sides of the dog, or long enough to reach the ground, and is absolutely straight (not wooly), shiny like silk and of fine silky texture without an undercoat. Coloring of the coat of the trunk, and the head piece are as follows. White or blue-white broken or closely blue absolute, or black, without brown coloring. Hair on the breast, pure white on the belly and the legs. The head with white-blue-gold, symmetrical colored. Any ear that is not erect. An overshot or undershot bite. 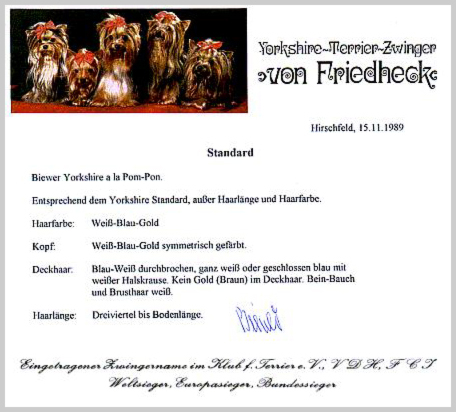 As of May 2002, Germany enacted the Animal Protection Dog Regulatons (TIERSCHUTZ-HUNDEVERORDNUG) in which it is NOW ILLEGAL to dock tails or ears, therefore any docing of tails and ears on the Biewer is considered FORBIDDEN in Germany. So ALL Biewers' imported, and shown, in the USA must have uncropped tails and ears. 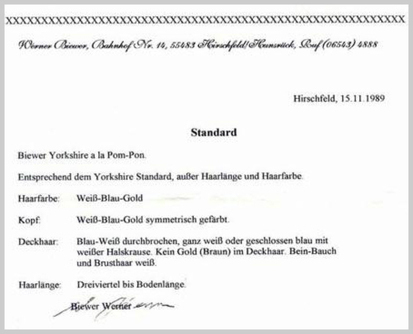 This Standard depicts the original standard, but the current new restriction from Germany will be enforced. Any Biewer shown n the United States or Germany must now be shown in its natural state. Any Biewer with cropped ears or tails will be disqualified.